I’ve been sitting on this project for a while, because I was seriously contemplating submitting the pattern to an online magazine… but I decided that it’s probably not unique enough to make the cut. This “eSleeve” is the first in my planned series of M2M (Made to Measure) patterns. This pattern is intended as an introduction for tubular double knitting. You cast on at the bottom or side and then knit it in the round, back and forth, on two needles. Depending on size and personal preference, circular or double pointed needles are used. If you’re not familiar with the concept of double knitting, you may be thinking that “in the round” AND “back and forth” at the same time is an oxymoron. Well, maybe it is, but it’s an “awfully good” technique to know! This is my favorite way to knit glove fingers and other smallish tubes, like baby sweater sleeves. It also lays the groundwork for variations that make it possible to knit double-sided fabric or – the ultimate knitting magic – a pair of socks one inside the other! The pattern also features I-cord, as both the cast off and on its own to make the integrated button loop. 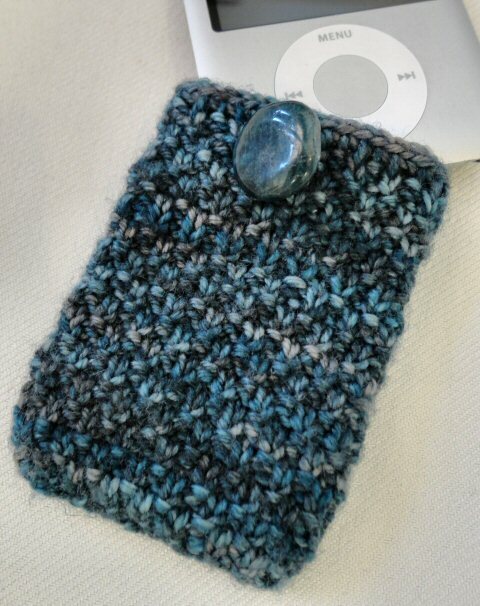 It has the advantage of being a quick, non-gender-specific item that is perfect for gift knitting! It doesn’t take much yarn, has a textured stitch pattern that looks good in solid or handpainted yarns, and provides a great opportunity to use one or two special buttons. Right now, I’m in the final stages of tweaking the pattern, and will soon have some help in test knitting. I will be teaching a class at my local LYS soon, and am looking forward to some good proof-reading and feedback. Once that is done, I’ll post it here for downloading (free! ), and list it on Ravelry.